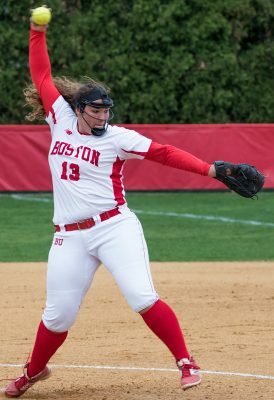 The Boston University softball team extended its in-conference winning streak to 12 games following its three-game sweep over Colgate University this past weekend, which included a big senior day victory on Sunday. The Terriers (21-25, 12-3 Patriot League) defeated the Raiders (12-28-1, 2-13 Patriot League) 9-7, 6-1 and 6-0 and now sit just two games behind Lehigh University for first place in the Patriot League. While the sweep was an all-around team effort, senior pitcher Makinna Akers was a huge factor, picking up the win in all three games. Throughout the series, she pitched 18 innings, giving up just one earned run, 14 hits and two walks while striking out 10. Perhaps her most dominant performance was Sunday afternoon on her senior day, pitching a complete game shutout. As Akers shut down Colgate, BU’s offense stepped up in clutch moments. In the first game on Saturday, the Terriers jumped out to a 2-0 lead in the first inning, but the Raiders eventually chased starting pitcher freshman Kali Magane after a grand slam from freshman Jordan Miller in the third. BU found itself down 6-2 in the sixth and 7-5 in the seventh, but forced extras through timely hitting. Akers then settled in, not allowing a run in extras, and the Terriers came through in the 10th inning. Senior shortstop Moriah Connolly got on base with a double, and junior outfielder Jilee Schanda ended the game with a walk-off homer the next at bat. Saturday’s second game was much less stressful for the Terriers. Akers picked up right where she left off only minutes earlier, allowing no earned runs through seven innings. BU took a 3-1 lead into the sixth, and senior infielder Gabi Martinez put any threat from Colgate to rest with a three-run home run to left field to extend her team’s lead to five, effectively ending the game. The Terriers completed the series sweep on Sunday through Akers’ lights out performance and small-ball hitting, rather than hitting home runs like in the series’ first two games. Connolly started the game off with a single and proceeded to steal second base to set BU’s single-season record for steals with 38. She came around to score on a double from Schanda. In the game, junior infielder Kaitlin Salinger also had a three-run double and sophomore catcher Alex Heinen had a two-run single. After honoring the seniors, Waters praised the influence they have had on the team this season after struggling early on.